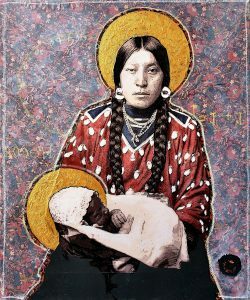 Ben Pease has been awarded the Jury’s Choice Award at the High Desert Museum’s Art in the West exhibition for his 2017 work “Honor and Respect Come to Thee”. It was among 226 pieces submitted in response to a nationwide call to artists for the Museum’s annual juried art exhibition and silent auction. 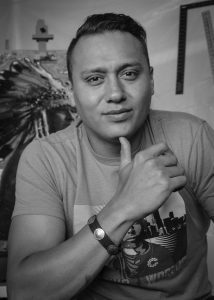 Ben is a young Native American artist whose work is deeply steeped in identity. Born on the Crow Indian Reservation in 1989, he has deep roots in both the Crow and Northern Cheyenne nations in southeastern Montana. 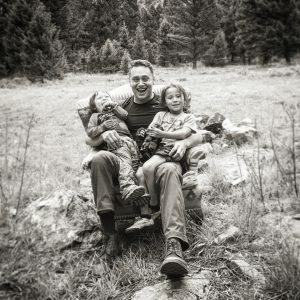 While Ben has been making waves in the art world for several years now, he is currently working on his undergraduate degree at Montana State University with a major in Art and a minor in Native American Studies. Ben considers himself a storyteller by vocation, and feels strongly that he has a responsibility to tell the stories of Native people. 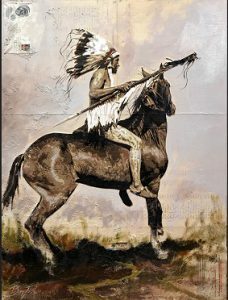 “Honor and Respect Come to Thee” is a mixed-media painting that shows a digitally manipulated historical photograph of a mounted Native American warrior superimposed on a rich and layered background composed of washes of acrylic paint, glass beads, antique ledger papers, an antique mail envelope and a US telegraph ticket. The dense but transparent surfaces of his paintings are somewhat hazy, and we get the sense that we are viewing an image from memory through the fog of time. His paintings are accumulations of meaningful materials and processes, where successive layers of later marks obscure earlier ones. The ledger pages remind us that we need to account for the past, and the acrylic paint almost becomes a kind of whitewash, which reminds us of our desire to avoid dealing with difficult and unpleasant aspects of our national history. Composed as they are of historical images that are depicted using a combination of traditional painting techniques and modern, digital processes, Ben’s paintings elegantly express the tension between the traditional and the modern. His works are almost a tug-of-war between the past and the present, and his imagery is a rich stew of culturally-transmitted memory and history seasoned with the awareness of what it means to live in America as a Native person today. What draws me to Ben’s work is his willingness to make art that can speak to difficult and painful aspects of the past while at the same time celebrating the positive elements of Native identity today. His work is a tribute to people who have been tested by great adversity, but have retained a strong sense of who they are and where they come from. “Honor and Respect Come to Thee” and the other works in Art in the West are on view in the Brooks Gallery through August 26. The silent auction culminates at the High Desert Museum’s gala, the High Desert Rendzvous, that evening.